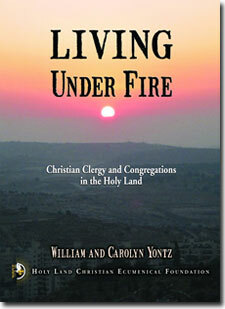 The Holy Land Christian Ecumenical Foundation (HCEF) is proud to publish, “Living Under Fire: Christian Clergy and Congregations in the Holy Land.” This research and report, conducted and authored by William and Carolyn Yontz and edited by Dr. Saliba Sarsar, is impressive as it examines the critical conditions facing Palestinian Christians and others in Jerusalem and the Israeli occupied territories. It provides a truly unique perspective on the current situation and future of the “Living Stones” there. Through intensive interviews with 38 out of 55 Christian pastors in Jerusalem and the occupied territories, William and Carolyn capture the trials and tribulations of the small but important Christian community. Interview discussions covered subjects such as impacts of the occupation, major challenges to the churches and communities, changes taking place now, emigration of Palestinians to other countries, and most serious needs of the Christian churches/parishes. The hope and the dream is that people across the four corners of the earth will read this report, reflect deeply on what Christians and others are undergoing in the Holy Land, and help them to help themselves. Many HCEF supporters, like authors William and Carolyn Yontz, and editor Saliba Sarsar have given of themselves to experience the daily living conditions of Palestinian Christians in order to discover for themselves the truth about is actually happening in the Holy Land. We extend to all of them our heartfelt thanks. The desire was to gain more first-hand familiarity and understanding of the challenges faced by the Holy Land Christians to be able to communicate the urgency of the situation to Christians worldwide. The fragile state of Palestinian Christians (“Living Stones”) in the Holy Land is well understood by those Christians remaining. Activities and restrictions connected with the Israeli occupation are all around them. The flow of Christians out of the Holy Land to other countries affects almost every Holy Land Christian family. Crises between Israel and Palestine have gone on for many years. These seem to renew themselves periodically and are reported in media around the world. Amidst this setting, there is minimal awareness of the Holy Land Christian condition in total, interdenominationally. This lack of awareness exists within, and even more so, outside the Holy Land. Thus, there is little current, consistent, repeatable information on the total Christian situation. These needs led to the birth of this research. To create a new “portfolio” of information that will help define the current, daily reality of Christians in occupied Palestine and Jerusalem. To establish baseline data that can be periodically updated and mentioned for changes. To gather and report information in a way that meets the criteria of consistency, equality, and parity among the entities of the Christian community. To provide information to the Holy Land Christian Ecumenical Foundation (HCEF), that will assist it in ensuring that its programs are consistent with the needs of Christians in the Holy Land.